The Trenton Free Public Library is home to Trentoniana, a local history and genealogy collection containing books, photographs, films, oral histories, scrapbooks, business records, personal papers, maps, newspapers, and ephemera that help researchers explore the rich history of the City of Trenton, New Jersey. A significant portion of the collection consists of local newspapers (most on microfilm - see the Microfilm page for a list of titles) printed in Trenton from 1778 to the present. Several indexes to parts of the collection are available, with more finding aids being created and made available (see the Finding Aids to Collections page). We also have an oral histories portal hosted by the Internet Archives (please pardon our appearance as we work on updating it). Also check out the “Mapping Migration: Chambersburg in the 1920s” project that uses 60 employee records from the Roebling’s Sons Company, created by student Irma Qavolli in Princeton University’s Program for Community-Engaged Scholarship. Follow @trentoniana1906 on Instagram, Facebook, and Twitter! We’ve started uploading films to our YouTube channel, and our Flickr page (TrentonianaCollection) contains over 350 unidentified photographs - can you help us? We also have a Tumblr page (but we’re not sure what we’ll be doing with that yet!). The Trentoniana Department of the Trenton Free Public Library educates, enriches, and empowers the citizens of the City through the procurement, preservation and presentation of historical and cultural material significant to local history and the lives of its residents. As a special collection of the Library, Trentoniana furthers the Library’s educational and informational missions by making these resources available for research, inspiration, and enjoyment. Trentoniana promotes the study and appreciation of regional and national history through educational programming, publications, special exhibits, and research services. Through the pursuit of these objectives, the Library enriches the quality of life in Trenton by preserving and passing on knowledge of the City’s rich cultural diversity and heritage. “The great task of libraries, worldwide, is the preservation of the ordinary” - from “Slow Fires,” a film on preservation. 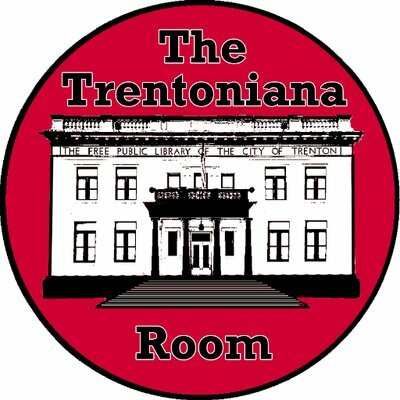 The Trentoniana Department collects printed and non-printed materials of all time periods relating to the City of Trenton, its residents, and to an extent the surrounding areas. This material includes non-paper formats, including video, audio, and digital items. All subjects relating to Trenton are considered within its realm of collecting – it may be about the City or by or about someone who lives or lived here. Trentoniana also collects material on subjects that have relevance to Trenton history, such as the American Revolution or the history of industry in New Jersey. Material that is part of the Trentoniana Collection is for in-room use only and may not be checked out. Photocopying and scanning of manuscripts and photographs is at the discretion of the Archivist, and on a case-by-case basis. Copying the contents of entire collections or publications is not permitted due to copyright laws. No food or drink in the research room, and only pencils may be used. A coat rack and lockers are available for jackets and bags. For more information on the Trentoniana Collection, contact the Archivist at 609-392-7188 ext. 20 or email trentoniana@trentonlib.org. IMPORTANT NOTICE - due to construction being done in artwork storage, the room will be open BY APPOINTMENT ONLY during the week of April 15th. PLEASE NOTE that hours for the Trentoniana Department are different from regular library hours. Updated hours are listed on the outgoing voice message at ext. 20. Please call ahead. Appointments are encouraged. Trentoniana is closed the weeks of June 17th and October 21st for inventory.